I think when a redstone signal hits a hopper it should change the direction of where the item goes just like rails. You would be able to make a lot more redstone contraptions like an item randomizer with hoppers and restone clocks. Applying a redstone signal to a hopper disables it. Might be nice if a hopper would automatically face the first inventory it detects, though. Considered mechanically, I'd prefer a 'helper block' that would reorient an ajoining hopper; this would avoid interfering in the power-to-lock-hopper mechanic already in place. Various proposals for a wrench tool (action similar to the debug stick available in creative) have been made and well received, suggesting that a similar functionality in a block might be workable. I like the idea of direction changing hoppers but not sure how they'd be able to make them work with redstone disabling them. Maybe an entirely new item instead that changes direction each time it despenses an item. Location: Do you really want to know? No, we don't need another useless block. 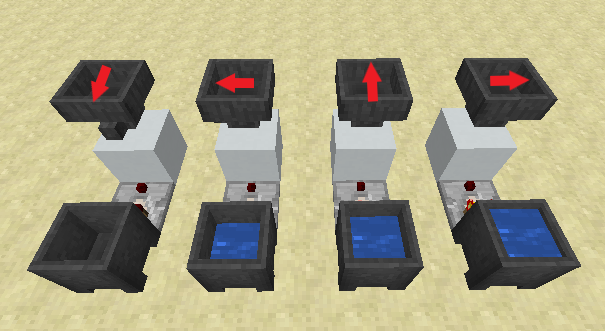 By placing a particular empty/filled cauldron next to a comparitor pointing into a block underneath a 4-way hopper will cause the output of the hopper to point in a particular direction. That might not be so useless. It would essentially be a factorio splitter, but from a strictly Minecraft perspective this would be the perfect block to encapsulate the item-filter concept...much like the observer was the perfect block to encapsulate the BUD concept. Given that a block only has 6 faces and this block would necessarily only have 5 faces available for output it would still make the old-style multiblock filter designs relevant.